What if? 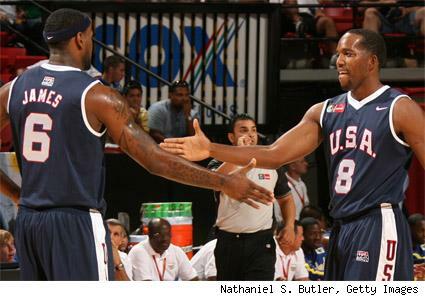 Michael Lee reminds us that LeBron James and Michael Redd are another great “what if” scenario on display in Vegas. In 2005, Redd was heavily recruited by the Cavs as a free agent. But he chose to show some loyalty (and a love of money), and in doing so might have cost Cleveland a dynasty. Redd is the ideal complement to LeBron: An unselfish scorer, accurate shooter, and enough of a vet to deal with the second fiddle role. Redd hails from Columbus and starred at Ohio State, so the temptation was great. However, in the end the Bucks’ six-year, $91 million offer won out over the Cavs’ five years and $70 mill. Lee also points out that, had Redd made the move, Larry Hughes would likely have stuck around in Washington. This may or may not have been a good thing; Hughes/Gilbert Arenas backcourt was thrilling, but Caron Butler is probably a safer and more useful sidekick. The Cavs offered Redd the best they could, and he wanted more. You can’t fault him for that.